Mt. Erie (population 105) is located in southeastern Illinois in the northeastern portion of Wayne County. County Roads #2 and #3 intersect in the middle of Mt. Erie. The Newton Branch Creek runs to the north and to the east of town. There is a Railroad Street that runs through town however there is currently no railroad that travels through Mt. Erie. The town of Salem is about 35 miles northwest of Mt. Erie. The history of Mt. Erie and its educational system can be found at the web address of http://www.genealogytrails.com/ill/wayne/mterie2003.htm. Our good friend Roberta Van Breisen sent us this information. The article provides a detailed history of the town as well as the followimf summarized history of the school. This article states that Mt. 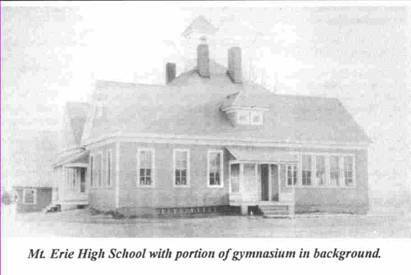 Erie High School was first established in 1914. It was but three years later that the decision was made to disband the high school. The vote was taken and a one-year high school was reinstated in 1920. This school was enhanced to a three-year high school in 1926. An outdoor basketball court was built this year as well. In 1931, through the leadership of Principal and coach, L.P. Henderson, an old wharehouse in town was converted into a gymnasium. This led to some very competitive basketball teams for Mt. Erie High School. 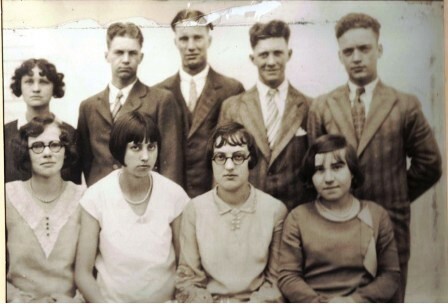 In 1940 the folks of Mt. Erie decided to add a fourth year of high school studies to their school. In 1943 the decision was made to revert to the three-year high school curriculum. The school year of 1950-51 would be the last group of students to attend Mt. Erie High School. Beginning in the fall of 1951, all high school students from Mt. Erie were bused to nearby Cisne High School to complete their education. This arrangement continues today. During its 30 year run Mt. Erie High School graduated 187 students. The fate of the original Mt. Erie High School building is being sought. If you have any of the needed information please e-mail us at ihsgdwebsite@comcast.net . It is a fact that Mt. Erie High School competed in boys basketball (www.ihsa.org). It is probabe that the boys competed in baseball and track as well. As you can see above, school team nickname, team colors, and school fight song are being sought. Conference affiliation is also being sought. The Mt. Erie boys brought home a total of three District titles in one six year period. Unfortunately the coaches names and team records of these and other great Mt. Erie basketball teams are not currently available. The postseason basketball scores listed below were found on a website titled "Illinois Postseason Basketball Scores." 1933-34 Fairfield District Tourney Coaches name & record needed. Mt. Vernon Won District Title. 1934-35 Fairfield District Tourney Coaches name & record needed. Crossville lost in title game. 1935-36 Record & postseason scores unavailable. 1937-38 & 1938-39 Record & postseason scores unavailable. 1940-41 Record & postseason scores unavailable. Clay City lost in semi-final round. 1942-43 & 1943-44 Record & postseason scores unavailable. 1944-45 Flora District Tourney Coaches name & record needed. 1945-46 through 1949-50 Record & postseason scores unavailable. 1950-51 Bluford District Tourney Coaches name & record needed. Woodlawn lost in District title game. **The loss to Woodlawn was the last game ever played by Mt. Erie High School. Mt. Morris, IL, Ethel Marie McKay, age 85, died Friday December 26, 2014 in Pinecrest Manor Nursing Home, Mt. Morris, IL. Marie was born May 28, 1929 in Mt. Erie, IL the daughter of Herman & Pearl (Anniss) Greifzu. She was a graduate of Mt. 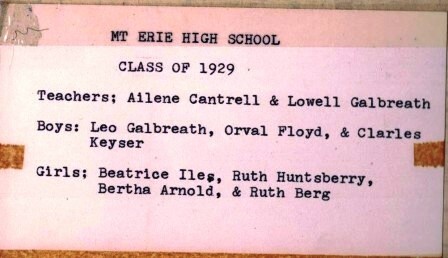 Erie High School Class of 1945 (3 Year Accredited School) and she was a graduate of Albion High School class of 1946."